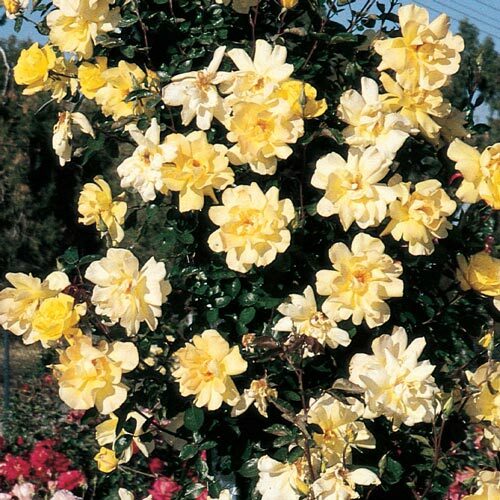 Golden Showers Climbing Rose | Gurney's Seed & Nursery Co. Award-winning. Abundant clusters of fragrant ruffled pure yellow flowers. Bright green leaves. Blooms on new and old wood. FoliageLarge, dark green glossy foliage. Long, almost thornless stems. Flower FormLarge 5"-5 1/2" semi-double with ruffled edges produced in clusters. ColorBright daffodil yellow turning pale creamy yellow. 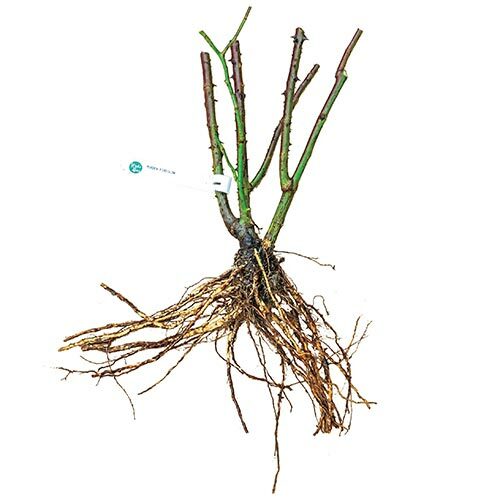 Soil RequirementsWell-drained, rich amended soil. Growth RateSlow at first because of its very free flowering nature. PruningDeadhead until end of summer. To shape and remove dead or old wood (see attached). CommentsThe finest yellow Climbing Rose. Create a spectacular show on trellises, fences or walls with this vigorous, free-blooming climber. Blooms on extremely vigorous 6-10' plants. Spreads 21/2'. Covered with 4shouldbedeleted double blooms from spring to fall. 1956 AARS winner. #1-11/2 field grown roses. Possibly the finest & most profuse bloomer of all yellow climbers. One of only 3 climbers to receive the All American Rose Award since its inception in 1938. Always in bloom. A constant source of cheerful daffodil-yellow from spring to fall. Moderate fragrance. Blooms on new and old wood. Cool temps give best color and size. DepthDig hole large enough to allow roots to be spread out. Firm soil and water well.